Tree houses in an ocean view setting. Here you will find a magical, romantic place three miles from Hana town that offers spectacular ocean views overlooking a flower farm from three jungle treetop tree houses.. These are real tree houses in a real jungle and not for everyone. Some people looking for the antiseptic controlled environment of a condo feel they are too rustic! The pavilion has a dynamic view of the ocean. It is very secluded, private and romantic. A private bathroom with toilet and shower is only eight feet away in a separate structure. 4WD recommended, or an extra four minute walk. It sleeps five comfortably, under mosquito netting. Propane stove and BBQ and all utensils included, plus fresh sheets and blankets...and a lot of flowers. The main room is 13' by 18', ten feet above ground, spanning African Tulip trees. It is screened and walled in with a queen size bed, and a small sleeping platform above with a futon for two more. An adjacent balcony with a panoramic ocean view has two hammocks. Down the stairway at ground level is a covered camp-style kitchen with a barbeque pit and a propane stove. 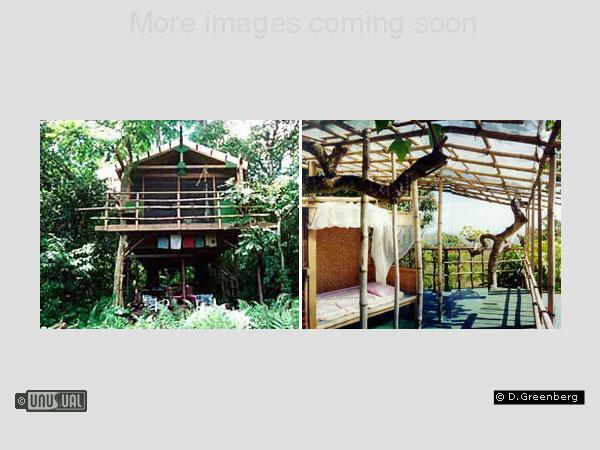 The bathroom is 25 feet away in a charming bamboo structure with toilet and hot shower. Pots, pans, dishes and fresh sheets are supplied. It is a real tree house, isolated with total privacy. Without electricity; the Tiki torches, and candles illuminate this magical natural setting. Treetops is over 1,000 square feet on three levels. Sleeping 4-6 people. The large master bedroom is totally screened in with an ocean view above the treetops. The kitchen and dining area are below on the jungle floor. A propane stove and barbeque pit for cooking and all the utensils. Fresh sheets and blankets & flowers are supplied. There is a small, quaint Hawaiian bungalow on the sundeck above for another couple. A few feet away is another Hawaiian bamboo outhouse with a regular flush toilet and a hot water shower. NO electricity, lit at night by tiki torches and candles. While you're staying near Hana, you should definitely check out Hana Lava Tube, a natural lava cave that offers a self guided tour, well worth the visit. This is SOOOO cool! Hawaii as it used to be (if you were Hawaiian royalty, that is). This is for the outdoor lover. sleeping outside in luxury.